Catonium ETPB (Ethyltriphenylphosphonium Bromide / CAS: 1530-32-1) is a white to off-white crystalline powder. Its chemical formula is C20H20BrP and it is mainly used as phase transfer catalyst in the production of epoxy resins and powder coatings. It can also be used as pharmaceutical intermediate in several synthetic processes.This material is highly soluble in water and polaric solvents. 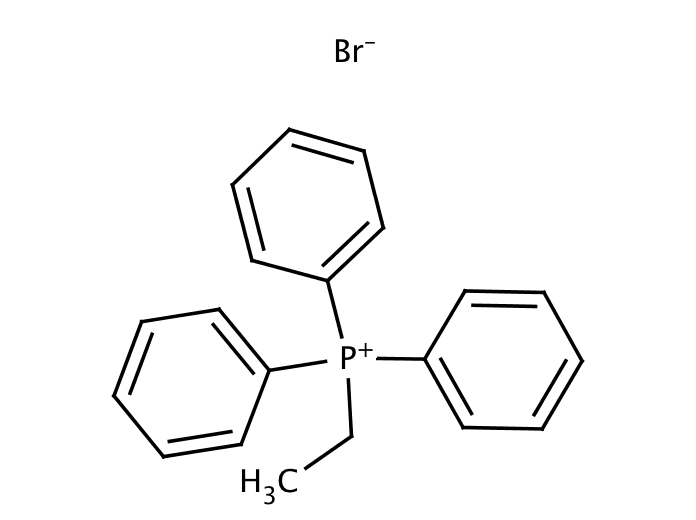 Ethyltriphenylphosphonium Bromide is also known as BETP, ETPB, ETPPB, ETPPBr, TEP and TREP. Europe / United States: CatOnium ETPB is ➔ on stock in our local warehouses. Our lead time is about one week if delivered in 20 KG drums. Ethyltriphenylphosphonium Bromide is a phase transfer catalyst, used to accelerate the cure of phenolic-based epoxy resins, certain fluoroelastomer resins and thermosetting powder coatings. CatOnium ETPB is also used as catalysts in the synthesis of certain organic compounds. Compared to amines, imidazoles and quaternary ammonium salts CatOnium ETPB features considerable better latency and thermal stability. Further it offers a low odor, minimal color formation and controlled reactivity. Available packaging: 20 KG fiber drums & 500 KG big bags. Store ethyltriphenylphosphonium bromide in a cool, dry and well-ventilated area and in line with legal requirements. A Material Safety Data Sheets (MSDS) is available for CatOnium ETPB and all other products supplied by Vesta Chemicals BV. This substance (CAS: 1530-32-1) has been registered under REACH (EC) 1907/2006. Ethyltriphenylphosphonium bromide | CAS: 1530-32-1 | Disclaimer. This information is supplied solely for informational purposes and Vesta Chemicals bv makes no guarantees or warranties, either expressed or implied, with respect to the accuracy and use of this data. All product warranties and guarantees shall be governed by the Standard Terms of Sale. Nothing in this document is legal advice or is a substitute for competent legal advice.